Coach Schmit recently completed his sixth season as the assistant men’s basketball coach at Montana State Billings in March 2018. 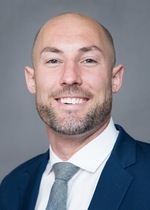 Prior to his time at MSUB, Brand spent six years as the assistant men’s basketball coach/recruiting coordinator at Morningside College in Sioux City, Iowa. Schmit joined the Mustang coaching staff following a decorated playing career in which he finished as the school’s all-time leading scorer and most prolific 3-point shooter in the history of the college. In 10 seasons as a player and a coach for Morningside College, Schmit compiled a 193-126 record (117-73 as a coach) including three NAIA National Tournament appearances, three Great Plains Athletic Conference (GPAC) titles and a GPAC Conference Championship. Prior to Morningside, Schmit was an All-State basketball player his junior and senior season for Jesup High School in Iowa, and finished as the school’s all-time leading scorer. He graduated from Morningside College with a Bachelor of Arts in Business Administration in 2006. Furthering his education, he earned his Master’s from Wayne State College in Organizational Management and Sports Recreation in 2008.